Steve Rice (Olympia, United States) on 20 April 2017 in Landscape & Rural. 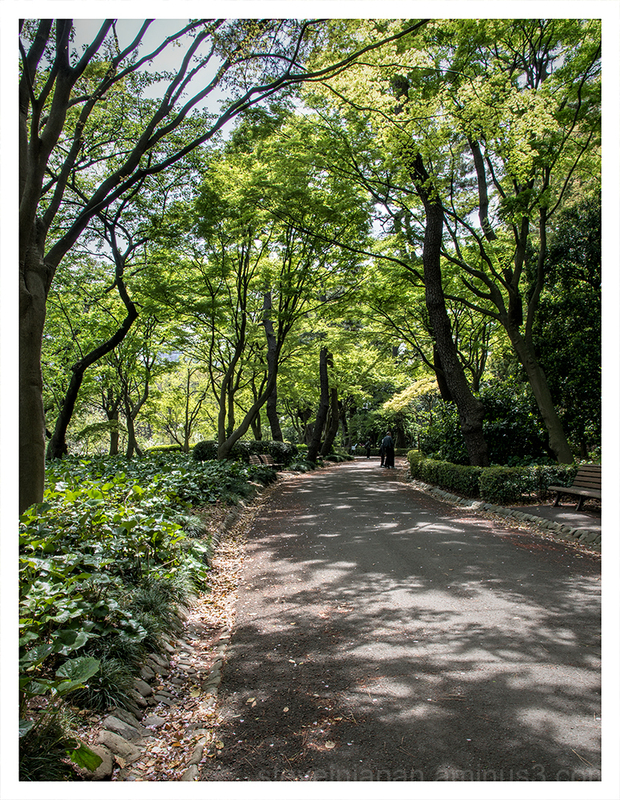 This green corridor is near the site of the Matsu-no-o-roka Corridor which was a long corridor in Edo Castle the floor of which was covered in tatami mats. The walls were decorated with paintings of pine trees (matsu) and plovers. It was in this corridor that Lord Asano Naganori attacked and wounded a court official named Kira Yoshinaka. As punishment, Lord Naganori was forced to commit ritual suicide. A group of his loyal samurai became masterless upon his death. They planned and plotted for more than a year before the revenge killing of Kira Yoshinaka. The 47 ronin were then forced to commit ritual suicide for murder. This true story was popularized in Japanese culture as emblematic of the loyalty, sacrifice, persistence, and honor that people should preserve in their daily lives. The tale of the Forty-seven Ronin has attained legendary status. Such a path is good for a man. Calm and shady. comme une invitation pour une balade Steve.. I can feel refreshing air ! Great perspectiv to the beautiful green in sun and shadow !The ritual suicide of samourais always impressed me ! Beautiful image with nice play light and shadows. What a wonderful place to walk around. The shadows in this excellent image are great. I like the beautiful fresh green in light. Excellent composition. A beautiful pass that makes me want to check it out. It's a very appealing picture. An excellent shot. Beautiful warm light that filters down and casts dancing shadows across the path!! I love the gorgeous greens! Such a peaceful place for this to happen. Wonderful narrative. I visited Japan in 1970 and if I remember correctly, we visited the place where the 47 Samurai were buried. What an amazing and gripping story tohave taken place in this otherwise peaceful and serene setting! A magnificentdtory and image, Steve! Oops !! What a sad tale here !! The path looks very beautiful with light and spots of shadows ! What a beautiful scene. Love this green corridor.